This post was contributed by guest blogger, Dalila Cunha de Oliveira. Bricking Science is an idea built, literally, 'brick-by-brick' to introduce people all around the world to the lives of researchers and PhD students. Unfortunately, unless they’ve worked in a lab, most people don’t get to experience this very human side to scientific research. Find Protocols Lab Tips to Keep Your Experiments Running Smoothly and "Gnome-Proof"
This is why the “Bricking Science” YouTube channel was born. The name came from LEGO bricks + science, and we “build science brick-by-brick”. Our mission is to help make science mainstream and to show people the very human struggles in the laboratory routine. We hope that sharing and laughing at these struggles will bring people together and make these daily challenges a little easier to overcome. We want to encourage researchers all around the world by showing them that they are not alone; a researcher doing some experiments in Brazil can have the same issues as one doing experiments in France. We can learn with each other through globalized, collaborative thinking. One night, while opening a LEGO set with my husband, I thought about how the limitless design possibilities of the LEGOs were mirrored by the nearly infinite regulatory capabilities of gene pathways just waiting to be discovered. As we started building, we thought – how can we make the connection between LEGOs and science more concrete to help further unlock the potential contained within each. There must be some way to use LEGOs, which are practically universally loved (except for those rare times that we step on them with bare feet), to connect people with science. And so, “Bricking Science” was born. We chose the stop motion format for our videos as it is the most approachable for LEGOs. Stop motion consists of taking many pictures, one for each position in a movement, and assembling the many pictures together to form the full movement. Producing stop motion videos is very time consuming; producing a 1-2 minute video takes an entire week of our free time. After taking almost a thousand pictures, my husband Enzo will spend a few days editing and later looking for songs and sounds to synchronize with the images thereby making the videos more real. To give you an idea of the amount of work, see how many pictures we take to make a walk cycle of one step. One major challenge when we started was creating a LEGO stage that resembles a real laboratory. It only took one night to build the first model, but because we are perfectionists, it took us a full two months to finally decide the LEGO laboratory was good enough. There are no premade LEGO laboratory sets so we had to purchase the big LEGO classic box, the Big Bang Theory set, and then use our imaginations to mold it all into a full laboratory. It is priceless to see our “toys” gaining life and working as scientists in a custom made, colourful laboratory. When we started, the hardest part of the process was to embed personality in pieces of plastic, but it’s gotten easier now that I identify with the main character in the video. We’ve grown attached to the work, and I confess that, when I finish building each scenario, I go “WOW, now I have my own laboratory” (the main character is much more than a piece of plastic for us now). With the personality in place, everything now is about the plot. This part is easy, after all, who working in a laboratory has never faced an odd situation with experiments? Our art simply mirrors our lives at this point! It was a great treat for us to put our rusty imaginations to use in this world where we are often trianed to follow protocols, guidelines, and standards. Bricking science reminded us of our inner children who have no preconceived obstacles, optimistically grasp at limitless potential, and who sometimes wish they could live differently than we do day to day. We discovered that it can be good for you and your experiments to think outside the box, be creative, and put your inner child to work. 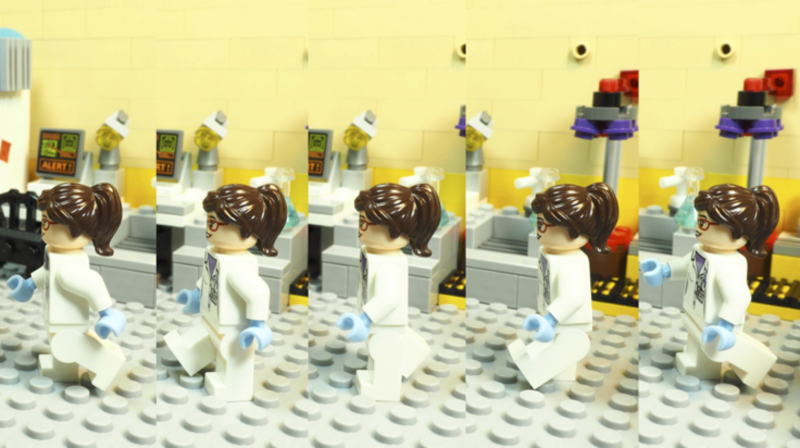 If you have an odd or quirky lab story you’d like to see portrayed in LEGO form, feel free to share with us at BrickingScience@gmail.com. Who knows, your story might just get “legofied”. Many thanks to our guest blogger, Dalila Cunha de Oliveira. Dalila Cunha de Oliveira is a PhD student in Hematology from Brazil and co-founder of Bricking Science.